Our hire shop has an extensive range of theatre & stage lighting so that any production or venue requirement can be met. Fresnel Spot lights project a circular soft edged beam. These can be hired either with or without barn doors on the front to allow a level of beam shaping. 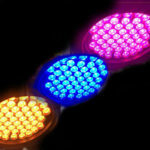 The hire shop has these staples of stage lighting in 500w, 1000w and 2000w versions. Follow spots or Roving Spots project a hard or soft edged beam with an iris to vary beam size. These are hired with a braced stand & dimmer ready for use. Follow spots can be hired as 1000w or 2000w sizes and the stage lighting legend Pani HMI 1200 is also available. Par Cans are designed for bands, Disco’s and other applications where precise beam control is not necessary. With 300w, 1000w and 1300w versions available for hire it is easy to configure the right effect and coverage. The Hire Shop has an ever growing range of LED lighting fixtures suitable for concert, theatre, exhibition and special events. Typically six LED fixtures can be powered from a single 10 amp household power point. Just add one of our DMX512 controllers and you have an instant light-show! Control connection to LED fixtures can be via cable or wireless link – speak to us for more details. The hire shop has an extensive range of lighting desks and dimmers available. 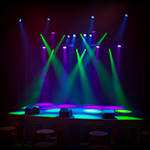 Dimmers control the intensity of tungsten stage lighting from zero to full. 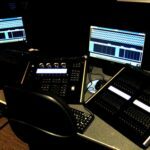 Controlled with a Lighting Control Console, intensity changes can be virtually instant or over any period that you need, and lighting changes can be recorded to memory and played back whenever required. The hire shop includes industry standard 12 & 24 Channel Jands Systems as well a high power single and multi channel dimmer racks. The lighting desks for hire range from the 12 Channel Jands Stage 12 which is useful for small events with a low stage lighting count through to the 72 Channel Avab 211 which is ideal for larger productions, or for use with LED stage lighting which typically require multiple control channels per unit to provide their lighting effects.